We inspected backup camera reviews, the best remote camera monitor models from top brands, and systems with quality backup camera monitor resolutions and durable components, and it all comes down to this. What Are The Benefits Of Having A Backup RV Camera? Can You Really Lower Insurance Premiums With A Backup RV Camera? Will My RV Backup Camera Require A Backup Sensor? Can I Install My Monitor Into My Dash? How Much Easier Will Your Next RV Trip Be? First and foremost is the prime Furrion backup camera model that everyone is talking about. Furrion intended to make a cost-effective system that fulfilled your needs, but cuts corners on a few other design elements. For instance, the display monitor is only 4.3” to save on costs. The picture is excellent quality, providing you with up to 39 feet of viewing space behind you, at a 170 degree angle. It gets a bit grainy when you flip it into night vision mode, but that’s just the thing: at this price point, you get night vision. They included a few other excellent features that really put this a notch above the rest. Not only do you get an IP66 waterproof rating, but there’s also vibration stabilizationhardware included for when you hit bumpy roads or dirt paths. It keeps the picture as clear as possible. While installation is a breeze and takes just five minutes, putting the monitor in your cabin isn’t so easy. The suction cup along the bottom for mounting is fairly poor quality, and will get distorted after a few attachments. Just be sure you have a clean surface when you apply it. Last but not least, what pegged this as the best backup camera in our opinion, is the overall value when you look at the entire purchase: one-year warranty, 100 ft wireless range, night vision, quick installation. It’s a package deal, and the very best RV backup camera for your money. Taking the silver medal in this race, we have ZEROXCLUB’s rendition of a proper backup camera. First of all, we’re big fans of the price, and the fact that they were able to include a 7” display with it. Connection is the main drawback of this model. You get a max of about 30 ft, and it gets shaky after 27. If you have a class A motorhome (average 40’ body), you’re not going to get much use out of this. The transmission will be shaky. Setting it up is very simple. Apply the camera to the back, mount the screen on your dash, and you’re ready to go. The whole process takes about three minutes. The only bad part about it, is that the connection cable to the lighter port is a bit shaky and doesn’t fully connect. There’s an IP69 waterproof rating alongside an 18-LED night vision camera function. You get a taste of the best features that really make this a versatile backup camera. It is not designed for extreme weather, so if you’re driving from Florida into Maine and there’s frost on the ground, you might experience issues. This is the best wireless backup camera if you’re in between budget and quality. Affordable and durable, you’ll be fully aware of everything going on behind you while you’re on the road. Competitively priced against the ZEROXCLUB model we just took a look at, Yuwei packs a serious punch. First and foremost, the display is spectacular. From the contrast adjustment options right on down to the configuration, it’s a great display. There is a long installation process though. Even though it’s a wireless unit, pairing the monitor to the camera takes quite some time. Following the instructions will eventually land you at a fully put-together system, but compared to installation procedures averaging five minutes or less on these other models, it leaves room for improvement. But you’re only mildly bummed about that, because above all else, you want it to function properly. Yuwei made this incredibly temperature resistant: there isn’t anywhere on earth that’s too hot for your camera to handle, and on the flip side, it can go as low as -4 F without problem. While this doesn’t include night vision, it does have multiple LEDs in the back to assist the camera for nighttime reversing. There’s a fair range of 140 degrees on your viewing angle, giving you an excellent depth of about 33 feet. Some of our favorite touches are the edges of the screen to prevent glares, as well as fact that you can sync this system up to an additional three cameras if you also want a camera on each side as well. You can look at any Rear View Safety review and get mixed responses, and we found the good and the bad to hold some merit after testing it ourselves. Know that this isn’t a Rear View Safety wireless model, and you will need proper tools to install this (more in the guide below). The mounting bracket that you get with the kit is fairly wobbly once you exceed 65 MPH. Even it it were to buckle, you still have the wire and its separate mounting rubber keeping it in place, but this is still something we didn’t like to see. There’s a lot to love about this backup camera however, including the 20 LED night vision along the back. While it’s not going to flip into that traditional green night vision mode, this allows even better clarity and a visible distance of up to fifty feet behind you. On top of that, there’s an auto dim feature to properly transition in varying lighting conditions. Think of entering a tunnel then exiting it one minute later: your backup camera will adjust within 1-2 seconds, returning that crystal clear picture. It’s waterproof, but doesn’t hold up well against low temperatures. We don’t recommend grabbing this if you’re looking for a wintertime camera. Out of all the Rear View Safety backup cameras on the market, this one was the all-around best choice. Even with the few gripes, they’re few and far between when stacked against the benefits. Cost-effective, powerful, and includes airplane mechanic-grade backup camera wiring for a flawless connection. The eRapta backup camera is our last one on display for today, but don’t worry: there’s still a plethora of excellent features waiting in store. For one, this has one of the most impressive night vision modes available, utilizing infrared lighting. This doesn’t include an auto dimmer like our top wired pick, but it does include a varied amount of options to color correct as you see fit. Your monitor comes with a quick menu setup for adjusting the RGB settings, and it’s simple enough that you could walk your passenger through the steps while driving should you need an adjustment. eRapta hasn’t had the best history of customer support. As of mid-2017 it appears to have been corrected, but there are far too many stories of inconsistent customer support replies floating around to put us fully at ease. When we called to test it, they responded quickly and helpfully, but it’s still something to be wary of. Last but not least, as the most inexpensive option on our list, you’ll be able to reduce your costs or go for two cameras at once. eRapta replaced the standard plastic lens that most models have over the camera, and put glass in its place. Less maintenance, tougher build. Waterproof, works well in adverse temperatures, and has a crisp display with little to no grain. A low maintenance option for the budget-conscious full-time RVer. It’s already harrowing enough to focus on backing up your RV, especially when you have a group of compact car-users huddled around you at a gas station pump, or they’re looking at you funny because you took up multiple spots in a department store parking lot. It’s even more difficult to get used to it you’re regularly commuting to work in a smaller vehicle, and you’re switching back and forth each week. We took a look at and tested the very best backup cameras models on the market to showcase, explain how they work, and delve into the subjects of installation, key features you should be looking for, and everything in between. So what exactly is an RV backup camera? Whether you go with a bluetooth backup camera or a Furrion observation camera, they all focus on the same primary function: helping you see your blind spots and make sound decisions based on the feedback. Using a monitor inside your cabin, you’ll be able to have an extra set of eyes to help evade issues that might have otherwise happened. Some RV veterans have gone through the process of backup camera installation solely for insurance purposes as well. Many insurance companies look at this as preventative measures, allowing you to lower your premiums each year. We don’t have to tell you how expensive those annual rates can get; it’s good to pinch every penny that you possibly can along the way. These apply to both wireless rearview mirror backup camera types as well as wired models. Either way, you want the principle of a rear view backup camera, and the benefits are the same no matter which type you go with. 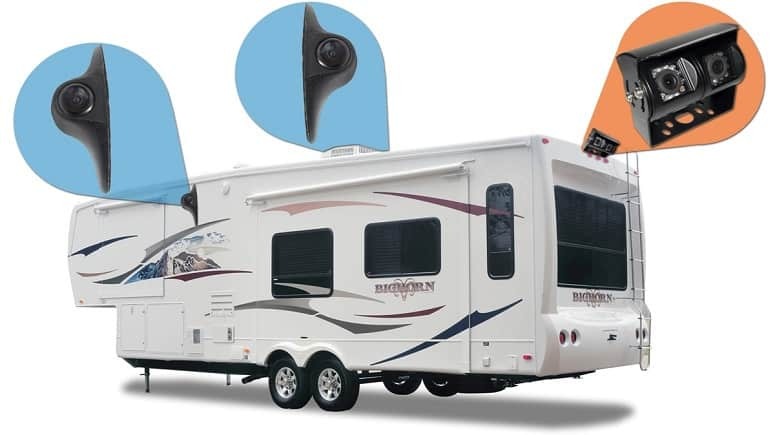 Collision Prevention: Quite simply, if you have a wireless bluetooth camera hooked up to your RV, you’ll have better control over your movements. 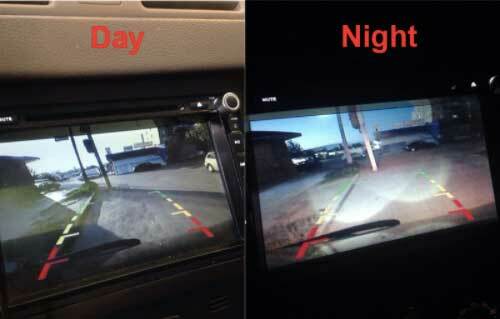 With RV backup cameras, you can set them to constantly display even when you’re driving. Monitor your blind spots, prevent collisions when lane changing, and understand when other drivers are being reckless. It’s an all-around safety precaution. Insurance Premium Reduction: Backup cameras were first conceptualized by Buick in 1956-1957, and once they became mainstream, vehicle insurance companies started offering discounts to drivers who had them properly installed in their vehicles. Companies who offer RV insurance might offer this discount, though keep in mind that not all do. It’s worth checking out your current insurance provider, or shopping around for a potential replacement. Eliminate Property Damage Possibilities: There are over one-hundred thousand hours of footage on YouTube alone, dedicated to big rig, RV and large vehicle accidents and footage caught on camera. You may be an excellent RV driver, but there’s no need to take unnecessary risks. Having one of these on your RV can help you better pinpoint awkward angles and structures, and prevent property damage when backing up or maneuvering out of a parking lot/tight area. Vehicle Security: The average class A RV costs around $78,000, which is four times as high as most new, low-end sedans. Thieves will target your expensive RV over the Camry sitting in the parking lot, and as we all know with home security cameras, anything that can identify a thief will deter them nine times out of ten. This is especially useful if you and your family are camping out for the night and you’re not at an RV park. We know why they’re a good idea, but slapping any ole camera on the back of your RV isn’t going to do the trick. We’ve outlined the main features that give you the best elements of owning an RV backup camera, as well as information on the installation process. Whether you go with a Furrion wireless observation system or find something that’s hardwired to your 12V electrical source is entirely up to you. Whether a unit is wired or wireless doesn’t impede upon its function, so long as you pay attention to the battery life on your wireless models. There’s no distinct difference apart from price: wireless systems tend to cost more than wired. Many manufacturers list specific makes, models and other information on their website, regarding the best RVs that their systems work well with. With a bit of ingenuity, you can use just about any backup camera on any RV. The main issues of compatibility that you’ll run into are focused around wireless receiver distance (if you’ve got a class A motorhome, you’re averaging 42 feet of distance between the console and the camera, so check the wireless range carefully). Rear camera installation doesn’t have to be a nightmare. While it’s true that wireless system installation takes far less time, on average, than a wired setup, it also depends on how the brand approached the subject. We avoided brands that don’t include proper instructions with their kits, so you won’t have to Google “How to install wireless backup camera” after you receive the product. This is extremely important, and depends on the width of your RV. You want enough of a view that you can see directly behind you, and a bit into the other lanes (especially if you’re on a six-lane highway and you need to swap lanes). The average viewing angle you’ll see is 130 degrees, which is fair enough to map out your environment and make sound decisions. You run into a difficult choice here: bigger displays mean a better view, but also require more dashboard space and can sometimes be a little too much. This comes down to the size of your RV’s dash, as well as your own eyesight. Most of the models on our list have 7” LCD displays, through our top pick only had a 4.3” display. It’s there when you need it without being completely in your face. We can’t stress the importance of a good warranty. Most of these models come with a twelve-month guarantee, some with thirty-day money-back guarantees, so don’t waste a single minute. 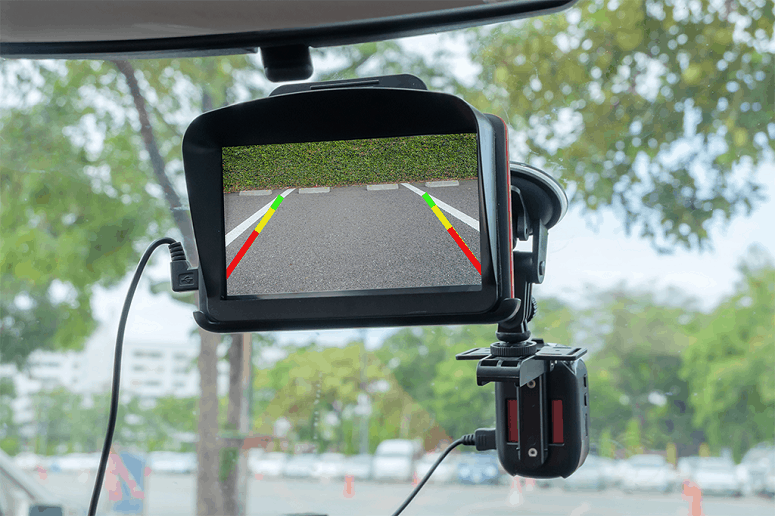 Even if you’re just prepping for a trip in a few months, you should install backup camera monitors first, then the camera, and test your unit as quickly as possible. More often than not, problems exist in the connection (on wireless models) than anything else, requiring you to try everything out in order to detect a potential problem. The type of RV backup camera you go for is going to depend on how handy you are, and what you fully intend to get out of it. We’ll go over the main benefits and some drawbacks of each camera type to help you whittle down your decision. Your backup camera install is going to be more involved and may require a touch bit of drilling (more on this during the installation walkthrough later). Whether you’re actually shopping for your RV, or you’re looking for a backup camera system for trucks, you’re still going to have the same amount of work to do. You’ll just be running less wire. Wired systems don’t lose connectivity like wireless models can, eliminating an entire category of potential problems. Longer installation, trustworthy connection, usually crafted from airplane-grade materials for the wires. A solid investment that upgrades your RV’s resale value. 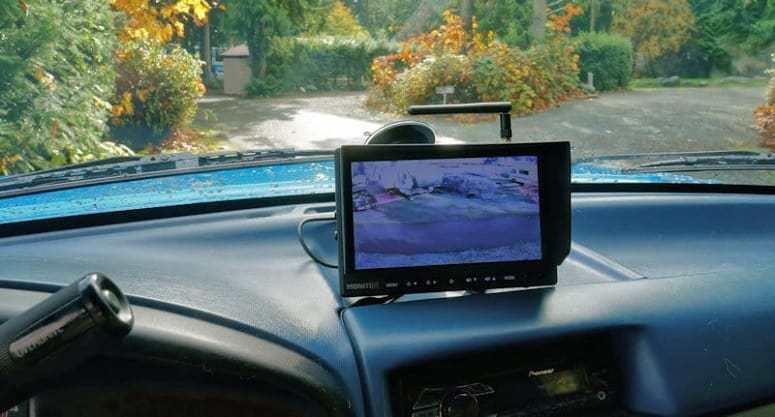 You can look at wireless backup camera reviews all day long, but you’re going to see the same issues, more or less: connection speed dropping over a certain speed, connection range for class A motorhomes, and things of the sort. However, they’re still a viable choice. If you grab a bluetooth rear view camera, you’re going to have maybe three minutes of installation time. They’re extremely easy, and sync to one another with ease. You also get the option to eventually sync up more cameras (dependent on the brand) to the same monitor, so you can see everything on all sides, no additional wiring needed. Single camera models are the most sought-after. You have one lens with a 130 – 170 degree angle, giving you plenty to look at directly behind you. These options cost less than dual camera units, and are easier to rig up extras. For example, if your brand allows it, you can hook up a rear and two side cameras for a full 360 experience. For dual cameras, this feature is hard to come by. Getting a portable backup camera allows you to bring it with you when you leave your RV dormant between trips. While having an affixed camera means that you run less of a risk of vandals messing with your RV, bringing in your wireless camera ensures that it won’t be taken either. Dual backup cameras have a much wider range, usually doubling the average 130 degree angle to 260. You’ll be able to see widely into each lane on either side of your vehicle, as well as a clear shot on the traffic directly behind you. The reason these models aren’t as popular comes down to cost. Single camera models are less expensive, and offer a similar experience. If you glance over our list, you’ll notice that they are all single camera models. We’re all guilty of one thing: waiting until the last minute to really look at the installation process for something we’ve purchased. Then we end up typing “How to install a backup camera” into YouTube, and spend forty-five minutes without learning anything. Before you make your purchase decision, we want to go through the installation procedures, step by step, so you fully know what you’re getting into. No surprises, no gimmicks, just information and a sound installation guide. For a wired rear view camera installation, you’re going to need an electric drill, sealant, tape measurer, your screwdriver set, and we recommend getting some zip ties as well. Bring something along to cut the excess. You’ll be placing this along the top of your RV’s rear. Most of these models aren’t intended to be placed along the bottom half, like you usually see with SUVs and minivans (better known as a trailer hitch camera). Use a tape measure to find the midway point of your RV’s rear, and find your bracket. You want to place the bracket up against the area, keeping it as centered as possible. Use a pencil or train your eye on the spot where the brackets are going so you know where to drill into. Three holes are required for your backup camera. Two that are usually 1/8 slots (refer to your specific purchase to figure out the exact numbers, these are just the most common measurements). You’ll mostly likely need a 3/8 hole in the center where the camera cable is going to run. Prepare your zip ties. You’ll have to find a good spot to run your wire through. In some cases, you might put your camera high enough that you’re feeding the wire into the roof, and you’ll have to find a way to access it through the interior of the RV. Locate the cable, and run it to your 12/24V DC system. Coil up any extra wiring. Most kits come with 50+ ft of wiring, which may be way more than you need. Coil it, zip tie it, and retrace your previous steps to zip tie any hanging wire. This secures it, and prevents it from rattling around while driving in the future. Wireless backup cameras are far easier to set up. It involves you setting up the mounting bracket, placing your charged unit where it belongs, setting the monitor up in your cabin, and using bluetooth to sync the two devices together. It’s a quick enough process that it doesn’t even require a numbered list. You should receive instructions in your package as well, outlining the entire process. 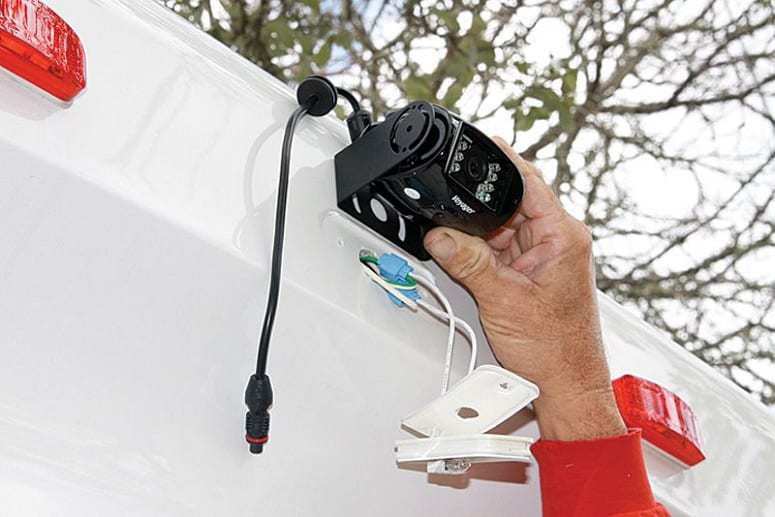 Here are five most mentioned features for backup cameras for recreation vehicles / campers. It’s not 1990 anymore: every electronic we purchase has the capability of being high definition. Your HD backup camera shows you a clear picture of what’s behind you in 1080p, so you’re not stuck with low resolutions and improper visuals on what’s lurking behind you. HD also has a hidden purpose, which coincides with another feature we’re going to talk about in a moment. If someone rear-ends you, you’ll have the most vivid photo of their license plate (most states require dual license plates). I don’t know about you, but planning out an RV trip with a set destination in mind usually means leaving at night. We’ve all taken very early morning or late night starts to our journeys, which is where night vision comes in handy. This may come in traditional night vision, where the screen displays a green hue over everything, but it might also include LED lights positioned within your camera’s lens. The infrared lights paint a picture behind you, and let you see clearly without that fuzzy gradient that traditional night vision often has. This comes in handy with HD cameras. Whether you want some amped-up security while you’re sleeping or to keep an eye on your campsite equipment, this will work excellently. Recording features usually work like car dash cams: they’re rigged to the internal power (so we’re usually looking at wired backup cameras here), and run on a loop, constantly rewriting old data so you don’t have to switch out USB sticks. If you’re siding with a wireless RV backup camera, you need to know about a little thing called vibration control. As you hit higher speeds of 70-80 MPH, your frequency (whether it’s bluetooth or traditional RF) has to cut through the ripping wind to push a signal through. Think about windy weather messing with your car’s radio: this is the same thing, more or less. Features in wireless models include connectivity stabilization, so you can use your camera at certain speeds without worry. You can wire these to run even when you’re just cruising on the highway, but if you don’t want the distraction of the lit-up screen, that’s okay. By running the appropriate wire to your taillight, you can configure your system to only become of use when you flip into reverse and you’re backing up. This is usually done manually and not a direct feature that’s pre-installed in most of these models. In truth, you could put a backup camera on just about any vehicle and receive a reduction in your monthly or annual premium. More and more vehicles are being manufactured with backup cameras, and as a result, we’ve seen a steady decline in auto collisions and property damage incidents from vehicles produced in 2013 to current. Because of the way RV insurance works, you can expect to see a $122 – $177 deduction on an annual rate, where the RV is being used more than 140 days per year. If you full-time it and you’re not just a weekend warrior, then that could be the cost of your entire camera over the course of one year. If your insurance premiums are based on a part-time use bracket, (under 140 days of use per year), you may only see deductions from $37 to $57. 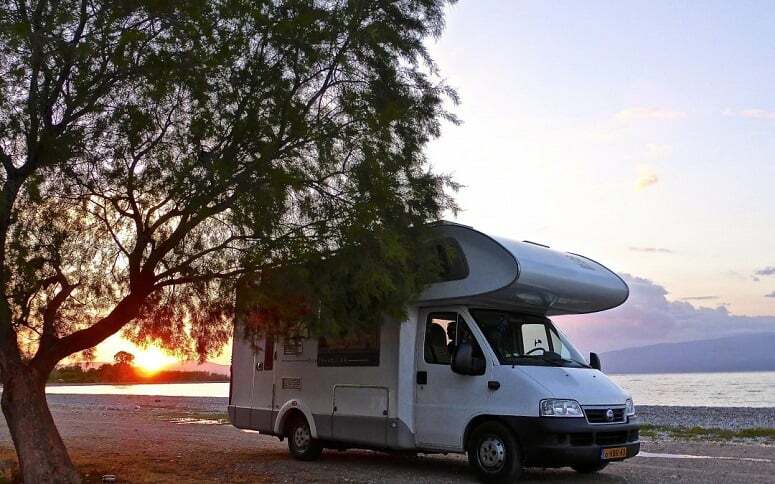 You didn’t come here just for a deduction on your premiums, so either way, you’re getting the ease of use that comes with an RV backup camera, while also saving a bit of money, no matter how you use your RV. You’ve probably seen commercials for minivans with backup sensors. They show grid lines, beep when you reach a certain distance, and look pretty fantastic. There’s a few reasons why you don’t need that in your RV. For one, you already know how to drive an RV. You’re acutely aware of the different issues you run into while on the road and parking. Your backup camera is just there to help you out a bit, and make those tasks a little easier. Not only that, but most current technology (2019-era tech) with backup sensors are designed around the diameter of the vehicle. For example, Kia and Toyota would need two different technologies, designed around their specific vehicles. Installing something like that on your RV would be nearly impossible, and would have to be included with the RV when you purchase it, designed by the manufacturer. If you look at vehicles that come with included backup cameras, they have a small monitor built into their dashboard, which makes it a little easier to maneuver when you’re on the road. The problem with most RV backup cameras is that you have a 4.3” – 7” screen just sort of staring at you. It takes up additional room, and can be quite awkward at times. If you’re thinking about installing it in your dash, you can absolutely do that. You just need the right brackets and a bit of know-how. You’ll need to either have a preconfigured area that you can mount this, or you’ll have to cut into the plastic of your dashboard to make room. Let’s assume that you’ve gone with a wireless model, so you’ve got to to keep it wired to the cigarette lighter adapter. You’d have to measure the area, ensure there’s no wiring behind it that would be severed from using an electric jigsaw, and make a hole that’s slightly smaller than the screen’s width (to give it a pre-installed look). Next you would need some brackets and mounting screws, and a conduit for the cable to run to the lighter. If you’re using a wired model, hiding the cable will be easier to achieve. That’s all a lot of work to put in, and we personally find it better to mount it using the stand you received with your purchase, and finding a suitable way to position it that works for you. We’ve all encountered parking and logistics issues at one point or another. With the best wireless backup camera in your arsenal, there’s no obstacle or tight spot you won’t be able to maneuver properly. Thoroughly review this guide, look at our selection of the best backup cameras on the market, and enhance your RV experience like never before.